There is a game from 1904 that some count as the first game played between the schools. However, the Evening Sentinel, the area's daily newspaper at the time, identifies the game as being played between Shelton High School and a team known as the "Derby Juniors". However, the Derby team actually had three freshmen from Yale University on the squad, so we are not counting it in the overall standings listed here. By the way, the Yale players couldn't make a difference for the Derby team as Shelton won by a score of 11-5. Touchdowns counted as 5 points that year. Derby claimed a last minute touchdown that would have made it 11-10, but the referee disallowed it. Another game - or not! 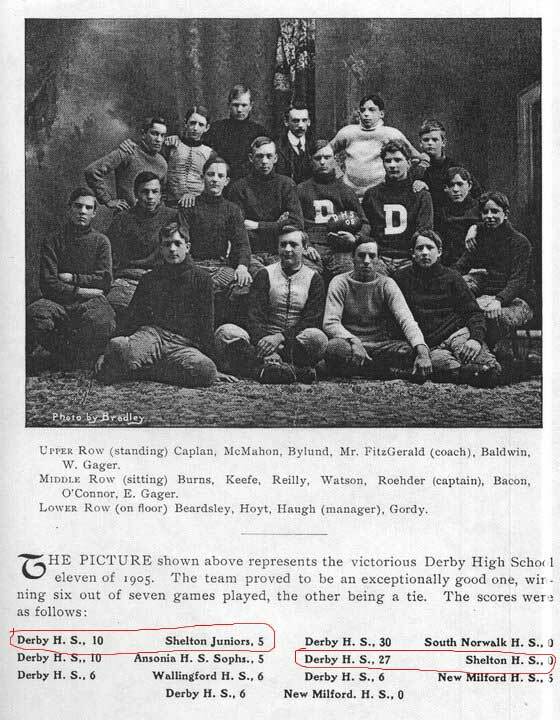 Take a close look at the schedule printed on this picture of the 1905 Derby High team, and you will see that our plot thickens as to the actual games played between the schools. Much as we saw a "Derby Juniors" team defeated by Shelton High School in 1904, we now see a Derby High team beating both a Shelton High team (27-0) and a "Shelton Juniors" team 10-5. Just as we do not have the 1904 game listed in the overall standings, we are not listing the 1905 "Shelton Juniors" game either. And the other from 1905 - maybe! Are there other games out there with the same controversy? We don't know but would appreciate any help in ironing this out and make a definitive ruling.